I finally finished the Final Fantasy XIV Lightning quests. Risa looks so good in cosplay! It’s a pity that the stats on the gear are kind of meh, but hey, can’t have everything, right? Also, I have a riddle! When is a boomerang also a book? See the answer, above. Apparently, the boomerang folds out and then upwards, and the pages are projected. Pretty nifty, huh? And hey, since I can insert pictures now, let’s have a cosplaying picture. Anyway, the title of this post is “canon crossovers”, so let’s talk about why. 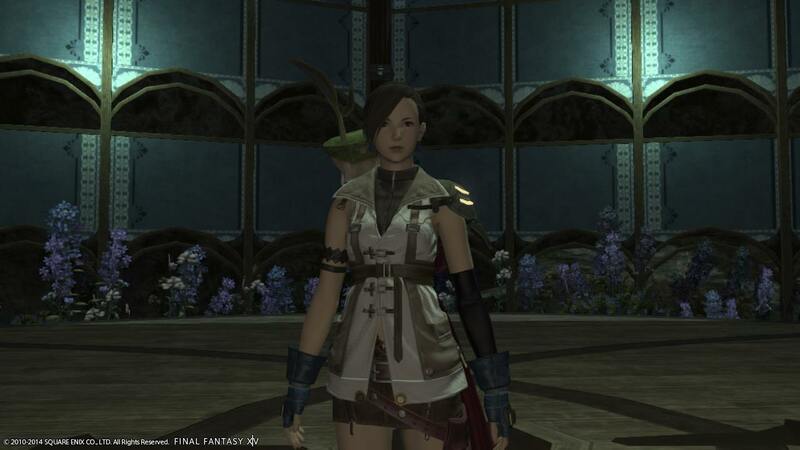 In Final Fantasy XIV, Risa got this outfit because Lightning (the star of Final Fantasy XIII) wound up in Eorzea. The player was tasked with helping her defeat a ton of different beasts throughout the whole game, getting a piece of her outfit at a time. There’s no explanation really given for why Lightning was in Eorzea. After killing the beasts, Lightning would surmise that it might have been a god that dragged her there. Now here’s where the “canon” part comes in. When you receive the final quest to help Lightning and get the last part of the outfit, the NPC will ramble on a little bit about meeting Lightning. She’ll also say that she gave Lightning a Miqo’te outfit, because why not? Maybe there was a legitimate reason for mentioning it, but I don’t really remember it. At the end of the quest, Lightning will comment that she’s not likely to remember her time in Eorzea, before vanishing in a flash of light. Even though Lightning is in her outfit from Final Fantasy XIII, her words throughout the game hint that she’s already lived through the plot of that game. 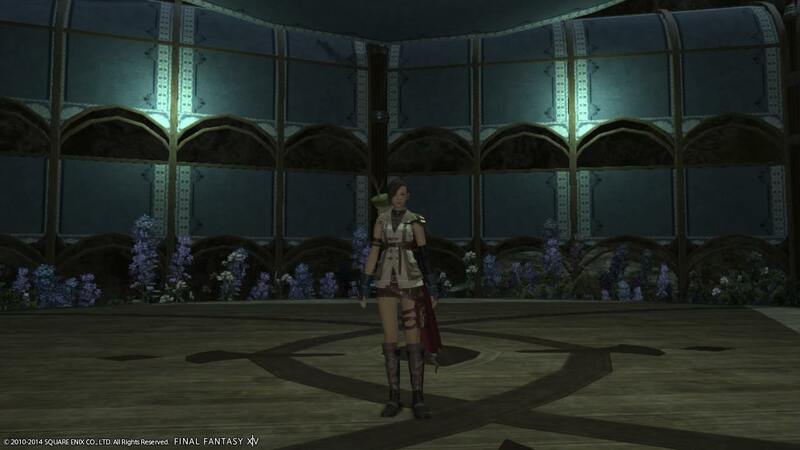 There’s a bit of time where she could have been sent to Eorzea by Etro before the start of XIII-2, but it’s doubtful. 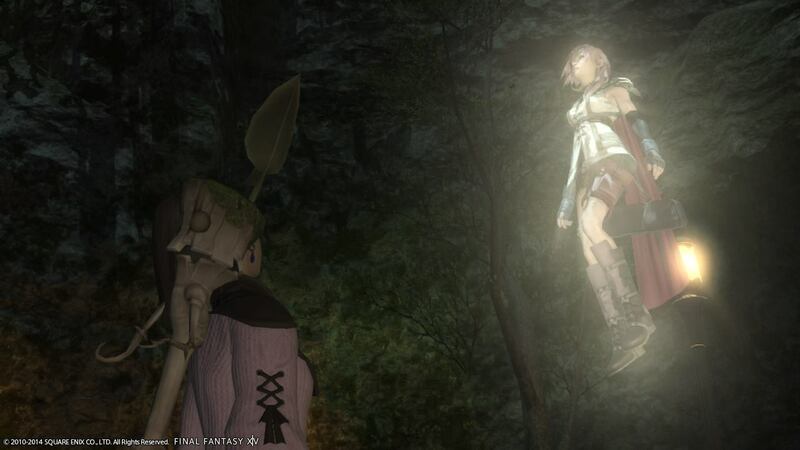 Lightning, in the first part of the quest line, claims that the last thing she remembered was sleeping. She was sleeping in the end of XIII-2. It’s likely that Bhunivelze woke her at that time. There’s no real way to account for the time that passed between Lightning waking up from her throne and her appearance at the end of XIII-2. Therefore, it’s likely that, if this IS canon, this is the time period in which Bhunivelze sent her to Erozea. Accounting for the change of clothes, Bhunivelze is a god. It’s likely that he put Lightning back in her old clothes. This also means that he can directly affect items in her possession – including a Miqo’te outfit. Now, on to Lightning Returns: Final Fantasy XIII. The Miqo’te dress is available in this game by completing a very simple sidequest. After completing this sidequest and getting the outfit, Hope pops on the comm and comments that the Miqo’te are said to inhabit a “mythical land” called Eorzea. However, it’s been said in this game many times that Hope knows things that he shouldn’t know. He says that it might have been Bhunivelze that put this knowledge in his head – but why would Bhunivelze put the knowledge of Eorzea and, specifically, the Miqo’te, in his head? My guess is that, as far as the timelines are concerned, Lightning’s trip to Eorzea is canon, and Hope knew about it. However, since Lightning doesn’t remember the trip, he has to say that Eorzea is mythical. Bhunivelze took the Miqo’te dress and put it in a place where Lightning could get it, but in a way that was easy to explain away. How confusing would it be to wake up with an outfit you don’t remember, right? This is just my interpretation of events in both games, mind. Could just be a continuity nod to the crossover event without canonizing it completely. Who knows? Final Fantasy XIV is a unique game. It has two sets of servers – one set for its Japanese players, and another set from its English players. Ideally, the players who speak those languages should have congregated on their native server, right? Well, when the game first came out, no one could access the English servers, so many of us English players were forced to play on the Japanese servers. There’s nothing inherently different about each server, mind – the client is still in the user’s chosen language. The only difference that you see is, on occasion, Japanese speakers talking in the chat box. While the game will autotranslate basic and game-relevant phrases, such as “Hi!”, full conversations are, alas, out of reach. Which brings me to the point of today’s post. While waiting for the Duty Finder to, well, find me something to do, I was wandering about in the area of the game called Coerthas. It was me and a couple of others, and we were wandering between the areas that are called FATEs – basically, a bunch of enemies or a boss will spawn, and if you clear them, you get bonus experience. These couple of others and I would wander between the FATEs and help each other kill whatever it was that needed killing, without any words said. It was only after about an hour of this that they finally said something – in Japanese. Without realizing it, I had been running around with players that didn’t even speak my language. However, that’s sort of the beauty of it. We didn’t need to share a common language in order to enjoy this game and assist each other. Their interface was Japanese, true, and mine was English, but our goals were the same. We played the roles our characters were in (I healed them and buffed them, they did damage) without needing to be prodded. When I ended up chased by all the monsters that were angry at my healing, they would draw them off me and let me heal myself. I’m in awe at this, and at FFXIV as a whole. Yes, I love this game – but now I have a whole new appreciation for it. It brings people from opposite sides of the world together, and you don’t even have to speak a word of Japanese. The Duty Finder didn’t do its job, though. Maintenance is here and I didn’t get to do my dungeon. Oh well. I made a promise that I would try to update this more frequently. This is me trying to keep that promise. I just don’t know what the heck to talk about. So, let’s go down the checklist. Life? Work, work, work. I like the pay I’m getting in the position I’m in, but I’ve let myself get on a crappy schedule so it feels like I can’t get anything done besides work! I have a week off coming up, though, and I have big, geek-filled plans. Gaming? Haven’t been doing much of it. Mostly been using my nifty PS4 for netflix, for cripe’s sake. 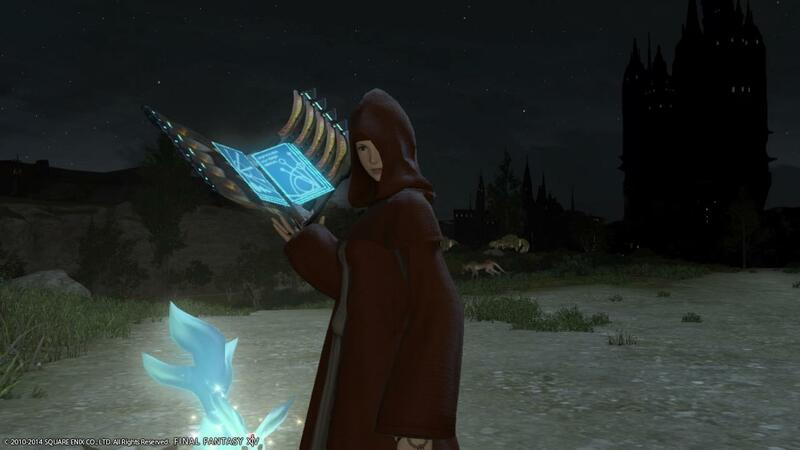 When Final Fantasy XIV comes out, though, I’ll be getting a hell of a lot of use out of it. Speaking of, I need to see about getting into the beta. Writing? I’m working on something for Valentine’s, but I don’t know if it’ll be done by then. Wish me luck! My new year’s resolution is to get two full novels done this year. I’m working on both of them off and on, so we’ll see which is done first.